This chocolate cherry banana bread is the perfect start to a summer morning --- a big thick slice topped with chocolate nut butter, oh my starzies... YES. You will be making this bread over and over again because you never want it to end! It starts with perfectly ripe bananas, Silk's Black Cherry dairy-free yogurt alternative, and sweet fresh cherries. 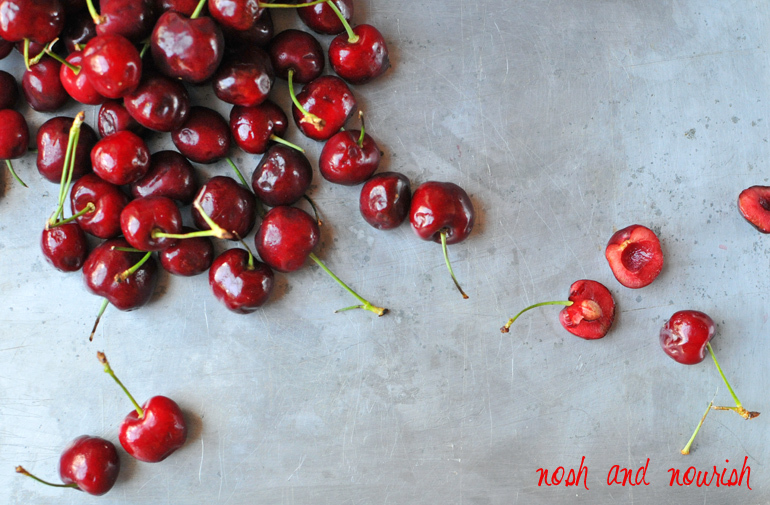 Have you seen my round-up post of the most decadent, delicious, mouthwatering cherry recipes ever? Including sangria (you neeeeeed this in your life! 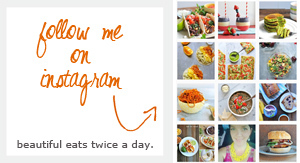 ), smoothies, cupcakes, salad, granola bars, and more. 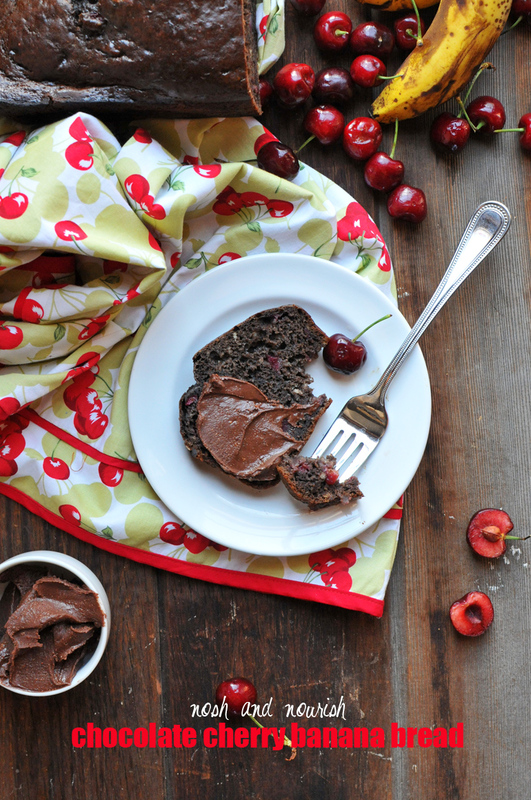 This chocolate cherry banana bread is so easy to make (simple ingredients in just one bowl!) and perfect to share with neighbors, new moms, your kid's teacher... basically anyone you want to make HAPPY. 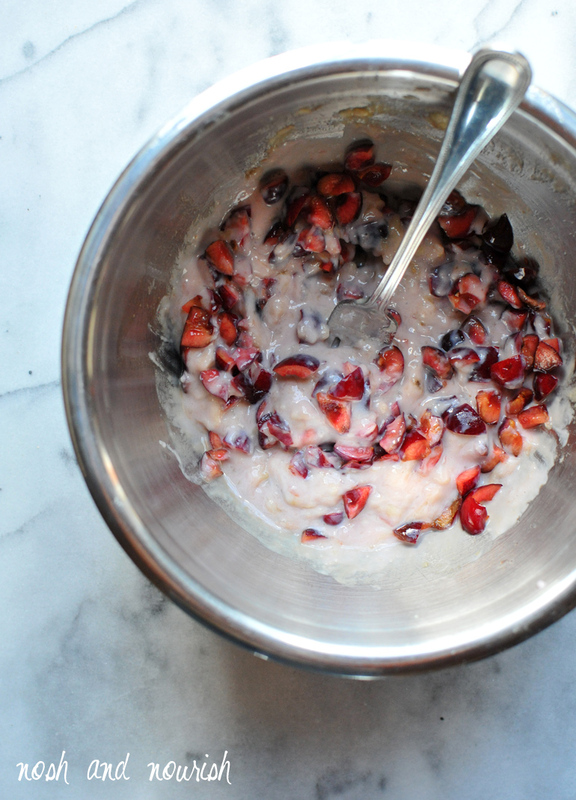 It stays sweet and moist from the Silk Black Cherry yogurt alternative, honey, and the fresh fruit. And as you may (or may not) remember, I created a lunchbox series on the blog as part of my year-long partnership with Silk. Every month, I share a new recipe and healthy lunchbox idea that's perfect for school, summer camp, or even an outing to the park. You can see the past ones here and here. 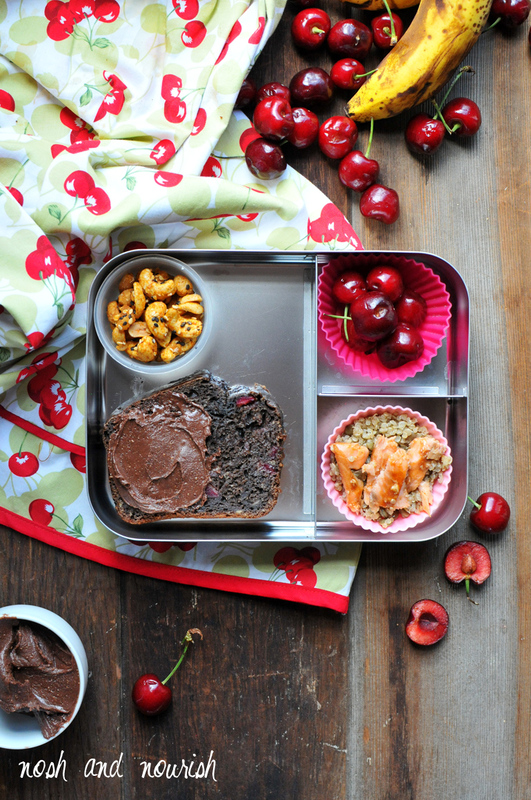 Chocolate Cherry Banana Bread topped with nut butter ---- recipe below! 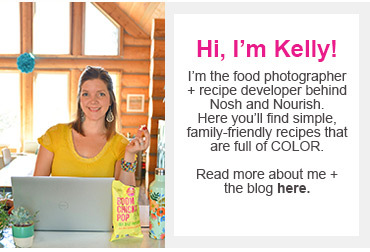 Be sure to sign up for Silk's newsletter to keep up with new product offerings, recipe ideas, get coupons, etc. They just came out with a new chocolate cashewmilk that I know you'll LOVE! You'll see it in an upcoming recipe (I'm thinking cupcakes) for sure! To make this bread gluten-free, sub in quinoa flour in place of the white whole wheat flour. 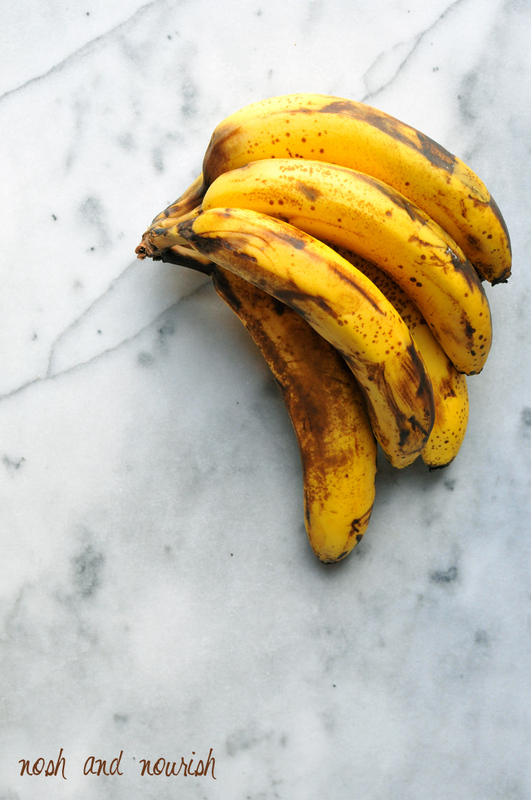 In a large mixing bowl, mash bananas with a fork until they are gooey and liquid-like. Add eggs, vanilla, honey, and the yogurt. Whisk until everything is well combined and there are no lumps. Then stir in the cherries. Slowly stir in the dry ingredients: cocoa powder, whole wheat flour, baking powder, and sea salt and mix until just combined. Put into the oven and bake for 60 - 70 minutes, or until the top is golden brown and a toothpick comes out clean. Let it cool for at least an hour. I prefer to let the bread cool completely and refrigerate overnight before slicing. Schmear with chocolate nut butter (optional, but HIGHLY encouraged! ).